Title: Not another bloody world cup. 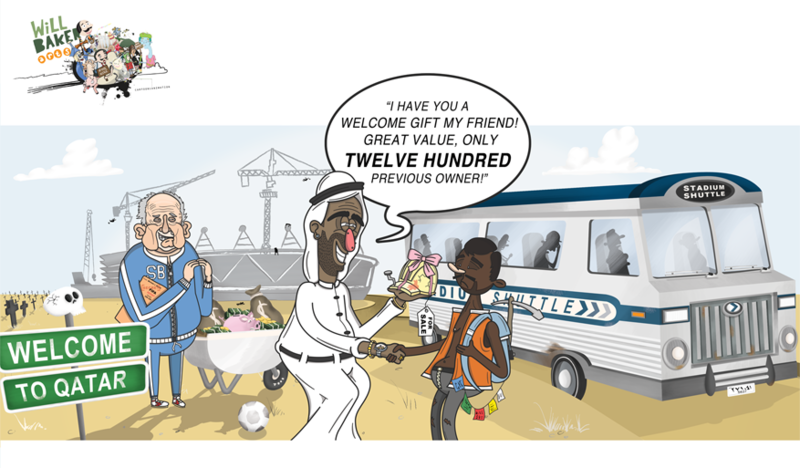 This single cell cartoon is about the controversial 2022 Football World Cup which will be hosted in Qatar. FIFA has infamously been in international news over charges relating to corruption, racketeering and bribery surrounding the bidding process nations must go through. Before this story broke human rights campaigners were bringing to our attention the unprecedented amount of migrant workers who were losing their lives while building the infrastructure set to host the 2022 World Cup. To date the total number of migrant workers who have died surpasses twelve hundred and, although Qatar has promised to improve their working conditions, further stories surface daily which brings more questions and more investigations into why FIFA awarded the largest sporting event in the world to the nation of Qatar.